This contemporary Thames two seater black PU leather box sofa is ideal for those of you who have limited space in your homes. It requires no assembly so you can begin using it as soon as it arrives. PU leather is a cheaper alternative to leather but looks just as great in your living room. Both comfortable and modern this imitation cheap leather sofa comes at an unbeatable price of just £199. No one will know that it is not real leather, unless you decide to tell him or her what a bargain you have had. We believe that you will be so happy with your purchase of the Thames faux black leather sofa that we offer a full refund if you are not entirely pleased. 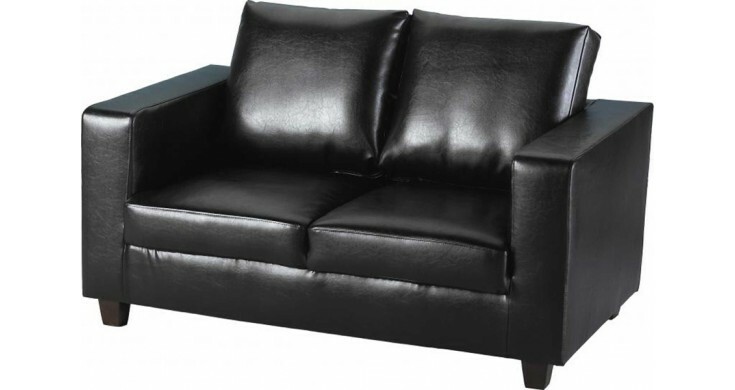 This faux black leather sofa can be delivered to you quickly so order one today at a fraction of the RRP. If you wish to discuss the sofa further then simply call and speak to one of our friendly advisers who can give you more information. Our leather sofas are cheap by price and not design so browse our collections today. The Thames is an Ideal cheaper alternative to paying the prices offered by high street stores and has PU leather on all areas of the sofa. It is available in both black and brown PU leather. Azki Bonded Leather Sofa Set Sale! Jeddy Faux Leather Range Sale!